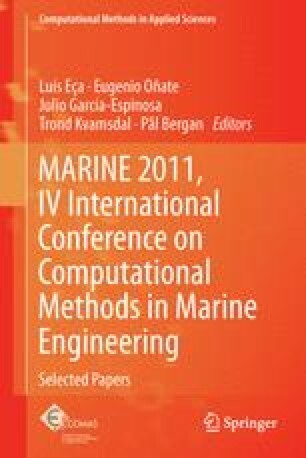 In this paper, CFD calculations for current loads on an LNG carrier and a semi-submersible are presented, both for model and full-scale situations, for current angles ranging from 180 to 0 degrees. MARIN’s in-house URANS code ReFRESCO is used. Numerical studies are carried out concerning iterative convergence and grid refinement. In total, more than 100 calculations have been performed. Detailed verification analysis is carried out using modern techniques, and numerical uncertainties are calculated. Afterwards, quantitative validation for model-scale Reynolds number is done taking into account numerical and experimental uncertainties. Scale effects on the current coefficients are investigated, having in mind the estimated numerical uncertainties, and unsteady effects are briefly studied. Good iterative convergence is obtained in most calculations, i.e. a decrease in residuals of more than 5 orders is achieved. The sensitivity to grid resolution has been investigated for both model and full scale using five consecutively refined grids and for 3 current headings. The differences in the solution between two consecutive refinements converge for all cases. The numerical uncertainties are larger for angles with small values of the loads. Comparison with experiments shows that ReFRESCO provides good quantitative prediction of the current loads at model scale: for angles with larger forces the CFD results are validated with 15 % of uncertainty. To determine scale effects the numerical uncertainties must be considered in order to prevent wrong conclusions drawn on basis of numerical differences rather than on physical differences. For the full-scale results larger numerical uncertainties are found than for model scale and for absolute values for scale effects this uncertainty should be improved. For the LNG carrier significant scale effects, i.e. more than 40 %, have been obtained for current angles where the friction component is dominant. For these cases the numerical uncertainty is relatively low. For the other current angles differences of 8–30 % between model and full scale can be observed, but here larger numerical uncertainties are found. For the semi-submersible the numerical uncertainties for the full-scale results are larger than for the LNG carrier. For the semi-submersible the pressure component of the force is highly dominant, i.e. larger than 90 % of the total force. On average the full-scale current coefficients are 20 % lower than at model scale, but larger differences for a number of angles can be observed.